A new initiative being set forth in the Bay Area, I Heart Art: San Francisco is a program sponsored by Etsy, Inc. to promote connectivity between local artists, organizations & institutions in a way which enriches our community as a whole. The holiday season is creeping up quickly and it’s my favorite time to discover new local artistic talent. I love spending my weekends browsing both the big and small craft markets for creative gift ideas and a few new small things for myself. It’s nice to treat yourself after a long exhausting day shopping for others! That being said these shows can be stressful! As a jewelry artist, I have done my fair share of shows and after the years have developed what I find to be as a stress free as possible system to make the event fun for me and everyone else involved. Not only can it be a tough day for you, but for anyone helping you as well. And don’t forget those shoppers. Most of these shows are jammed packed full of people in a space hard to get around with so many pretty things to see. A friendly and totally relaxed designer behind the table can totally brighten a tired customer’s day. As well, a smile seems to help induce an urge to spend so smile big. The first step to a successful show is planning ahead. Sounds easy right? Well believe me this seems to be something many first time craft show participants forget. Of course, my planning starts with a well thought out attractive design. If your first big show is Bazaar Bizarre or Renegade then keep in mind there will be a lot of amazing booth displays. The people that participate in these events are insanely creative and put a lot of time in thinking about their space. These are competitive shows. If you sell jewelry and one third of the artists at the show do too then you will need something to draw in the customer’s eye. There is nothing worse than spending all of that money to be in one of these big shows and then have no one notice you because your display lacks pazazz. Whether you prefer simple, clean displays or more ornate ones, make your space stand out. People often don’t purchase during their first stop. It often takes them once or twice past your booth to pull out their wallet. You want people to remember where they saw that beautiful bag and a striking shop will help them find you again. I always do a lot of research about current space designs. Hit a show a few weeks before yours to make sure you still feel comfortable with your plan. Look at photos online of last year’s event so you know what is expected. I set up my table in my home a week before the event so I can make adjustments as my thoughts change. Just like with the piece you are designing it is often good to walk away for a bit so you can think about it from a different angle. When I feel committed to my plan, I mark and map where I want things to go so the day of the show, during the hour I give myself to set up, things are easy breezy. Very important, arrive early! It shows professionalism to the event coordinators, a few shoppers always come early and it impresses the heck out of your neighbors. An easy paced set up helps give me the confidence to deal with the long day ahead. Arriving early also gives me the time to relax, have a cup of coffee or mimosa and take notes in my sketchbook. During this time, I watch what others are doing. What did other people use to bring in their work? What cool materials are they using for their display? This is a great time to pick up new tricks and tips and to walk around and explore. You won’t have much time to do this once the show starts so take advantage of it then. So then there is the next 6 to 8 hours. Whoa right? Well again the best thing you can do for yourself is to get enough sleep so 1. You look good, 2. You can maintain a smile all day and 3. You end the day excited and not spent. For very long shows, I set up times for friends to come and work my booth for 30 minutes. For this I give gifts. Who wouldn’t help a friend out for a glass of wine or a free pair of earrings. Shows like Bazaar Bizarre give out things to vendors, food and drink tickets etc so I pass those on to my little helpers. The short break and a visit from a familiar face means a lot. As well, I take more than enough food and beverages so in case my friends run late during lunch time I am all set. As I mentioned earlier, many people don’t purchase during their first visit to your booth so you need to find ways to make them want to come back. That isn’t always about the fact that you make killer stuff. It is also about being an awesome, friendly person. I have had many people return to my table simply because they said that I was the friendliest vendor there. Keep it natural, not sales person like and make people feel good. My secret ammo, I give out compliments, thank people for stopping by and make pleasant small talk about them. Doing these three things makes the experience about them and believe me people eat it up. Who doesn’t want to buy a dress from someone who just gushed about how pretty the color looks on them? Of course, doing this with grace isn’t always easy, so I suggest practicing on your friends everyday. It’s not a bad way to live anyway. Gather as much info you can about the people that you meet that day. Send thank you emails to everyone who signed your email list. Make a friend with another vendor and touch base post event to discuss how they felt about the show. There is a lot to be learned here. I believe the smartest thing you can learn about life is admitting and accepting that you don’t know everything. When you leave the event, pack things up carefully in the proper places. Ideally, when you return home you can just pack things away easily and in an organized manner so for the next show you can just pull everything out and be ready to go. Each show should get better and easier with more and more time for customers and mingling. Shelly Kerry is co-owner of Lightbox SF and developer of Creating Space, a time and life management program helping people create more conscious and fulfilling lives. Contact her at shelly@lightboxsf.com to set up a free consultation. This post was originally published on the Lightbox SF blog. In getting ready for the holidays most of the focus goes toward having the most awesome booth display, getting plenty of stock ready, and polishing up photos and descriptions. And while that’s all necessary work, as you want to attract as many customers as possible, do you know how to keep those customers coming back? This holiday season I want you to focus as much on building customer relationships as you do on actually selling. The holidays are a time of great exposure. New customers see you at craft fairs, find you through Etsy and Google searches, or see your product reviewed on a blog or gift guide. So now that you’ve gotten their attention here’s a few things you can do to keep it. Have business cards or postcards at the ready when you’re doing a fair and throw one or two into every item you ship. Make sure all your contact information is there, email, website, Twitter, Facebook, Etsy shop, etc. Many of the people who come into your booth won’t buy, but that doesn’t mean they don’t like what they see. Give them an easy way to make sure they remember you. If your cards are pretty enough they might even end up on a bulletin board for even more to see. Collect emails every chance you get. Put a newsletter sign up on your website and have a sign up sheet out at fairs. Let people know what they’re signing up for; updates on shows, discount codes, and first news of new items are all enticing reasons. Sending a personal thank you to every buyer is an unexpected surprise that will make you stick in the customer’s mind. It can be a simple email or note stuck into the package saying thank you or you can offer a discount on a repeat purchase or something they can gift to a friend. Encourage them to sign up for your newsletter in this thank you. Once you have an email list, use it. Send a special note to all of those people that signed up over the holiday season and give them a taste of what’s coming up in the spring or give them a recap of all the great fairs you were at. Then keep sending them news throughout the year. Once a month is about right. They can always opt out if they don’t want to hear from you, but if you provide useful or interesting information they’ll look forward to getting each installment and may even forward it to friends. This newsletter should also be more professional than a quick note from your gmail account. Try Mail Chimp for a low cost (or even free) option that also looks good. If you’re regularly reaching out to your fans with interesting and useful news you’ll stay at the top of their mind the next time they want to treat themselves or give a gift. What special way can you connect with your customers after the purchase has happened? This is the first in a series of posts focused on helping you build a Better Booth Display. Holiday show season is here! Part of preparing for the shows is coming up with ways to display your items. One must consider, table type, table covers, backdrops, signage, seating, displays, etc.- not to mention easy packing and keeping the weight light. Hardware stores are fabulous places… but have you considered salvage yards and thrift stores? You can save a small fortune on base supplies and ‘ready to wear’ displays. The other week I went to Urban Ore in Berkeley for inspiration. If you haven't been there yet, set aside a bunch of time- it's 3 acres of recycled goods! Ok- maybe you aren’t so handy with tools or don’t have the space or the time to create your own. No worries! There are many ‘ready to wear’ displays available- baskets, glass/wooden/metal trays, shelves, glass front cabinets, window shutters, fireplace screens, mannequins, and even sections of actual retail display racks. Have you ever thought about using an old wooden chair on top of the table for height? It’s an instant shelf and with some screws or hooks around the seat edges etc. you can hang plenty of items from it. How about using an old paned window with screws in the framing to hang items? Same thing goes for old cupboard doors and odd items like vintage washboards. How do you make them stand- screw a couple hinges between them to create a folding screen type of unit. Use old frames (you can even do a quick coat of paint) but use fabric or printed photos and some corkboard underneath it where the photo goes and create mini free-standing cork boards to pin your items to. Many salvage yards and thrift stores have tons of options here. You can find everything from retail and home lighting to room screens and folding chairs for you booth- even in painted colors! Maybe you aren’t into a rattan folding screen, but think of it spray painted apple green behind you with a sign hanging from it. It can help create a ‘booth’ feel even with just a table top display. Need height on your table- use old floor boards with old books or cement blocks between them. Want instant flat backgrounds under your items on the table- use old tile or mirrors. You can have a very pulled together look even with salvaged items. Pick one or two materials and use only items with those materials. Example: Glass and Iron- You can use dark iron wire racks and towers for hanging and a mix of glass trays on the table. Even if the trays are different styles, if they are all glass they will look consistent. Send us love notes (comments / questions) via email. It's Social Media Week over at Etsy and each day they're sharing all sorts of tips and tricks on using social media to build your business. They're catering to everyone from newbies to experts so you're sure to learn something no matter how experienced you are. The week will be filled with highlights from the Seller's Handbook, livestream workshops and chats, but the big event is Thursday when comedian Eugene Mirman, Twitter's Elizabeth Weil, Amy Turn Sharp of Little Alouette, Etsy's own Laura Chin, and Jen Rubio from Warby Parker come together for Almost Internet Famous. Check out the full schedule and sign up for the livestreams to soak in the knowledge. Hello everyone! My name is Genevieve and I am honored to be introducing myself to all of you as the new Co-Chair of I Heart Art: San Francisco along with the much loved Steph Cortes. Some of you may know me as the Co-Founder of Lightbox SF, the creative business coaching service I run here in San Francisco. For those of you who've never heard of me before you can read a little more on our Who page. You may be thinking that I have a lot of "Co" titles in my life and well... I do. I believe in collaboration and community and not going it alone, so I guess it's fitting. That's also the part of I Heart Art that I'm most excited about, creating and supporting the local community of crafters, artists, makers and creatives. Over the coming weeks we'll be running a series of blog posts focused on creating the best booth display ever. We know many of you are in heads-down mode getting ready for the chaos that December will bring and we want to help you make it the best holiday season yet. So keep checking back over the next few weeks for advice, resources and tips to make your holiday shows a smashing success. Steph and I are also in the beginning stages of planning an after the holidays social. Once we've all made it through and had a little recovery time we want to gather to lick our wounds and trade war stories. Of course this will also be a chance for us to talk more directly to all of you about what you want to see for I Heart Art in the coming year and for us to answer your questions. We'll let you know as soon as the details start coming together. Lastly, I also want to encourage all of you to send us your questions and suggestions. I Heart Art is still new to San Francisco and we're just figuring out what it should be. While Steph and I have many ideas it's also for all of you, so please don't hesitate to tell us what sort of support you need and programs you'd like to see. Send us comments and questions via email. Watch Hello Etsy LIVE all weekend! It's so amazing that we can all participate in a worldwide event like Hello Etsy as a community, don't you think? If you can't make it to the Hello Etsy event happening at CCA, our community has come together to host a FREE viewing of this global conference at your local TechShop SF! There's already over 50 peeps RSVP'd for this Sunday's broadcast! Click here for details! 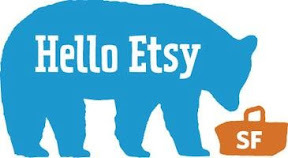 Check what's happening with Hello Etsy here! There's a small business symposium happening right here in San Francisco in less than 2 weeks that's going to be focusing on how we can help grow our micro-economies. That symposium is Hello Etsy! Our amazing partner, California College of the Arts will be hosting this one day conference on Sunday September 18th at their SF campus. Tickets may be sold out, but there is a wait list that you can sign up for on the Event Brite, along with a few alternate ways to participate in this global conference! You all remember what wonderful hosts the folks at TechShop SF were for our launch event, Craft Party 2011! They love hanging with the makers in San Francisco so much that they've invited us to check out the Hello Etsy Conference - Livestreamed via satellite! More details here! Yes, it's true! We have the technology to bring the various talks from our Hello Etsy event right to your computer screen via the Etsy Online Labs. There are several Hello Etsy events happening around the USA while the main event goes on in Germany. Check out the speakers and the schedule here! 3) Throw your own Hello Etsy PARTY! Creatives around the globe unite under the same roof to make awesomeness happen all the time - why should Hello Etsy be any different? Feel free to check out this link for helpful tips on how to make the most happening Hello Etsy shindig at your place with a few of your closest crafty homies! Those are just a few ideas for right now, but STAY TUNED for more info about the rad resources that Hello Etsy will be providing to our amazingly creative community in the next couple of weeks! What do you do to help grow your micro- economy? I.e. Shop locally, source from other Etsy sellers, do supply swaps in your neighborhoods..? We'd all love to hear about the best resources in San Francisco!